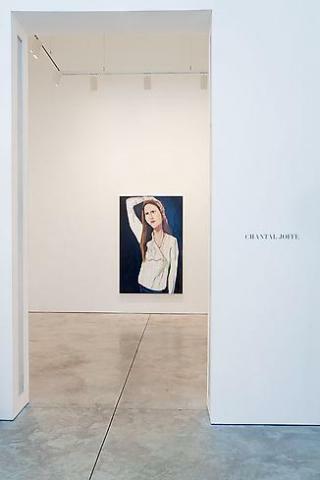 Cheim & Read is pleased to announce an exhibition of new work by British painter Chantal Joffe. This is Joffe's first solo show with the gallery. Born in 1969, Chantal Joffe studied at Glasgow School of Art and in 1994 received her master's degree from the Royal College of Art, London. Associated with the second (and more paint-focused) wave of young British artists, Joffe works mostly from secondary source material—magazine ads, fashion spreads, snapshots. Her painting style, fluid and loose, is simultaneously bold and distinctive; as she has stated, "I don't like the lack of commitment to a mark." In the tradition of Alice Neel, Joffe's unsentimental portraits, mostly of women and children, convey an emotional and psychological intensity, belying the objectification of her subject. Joffe's recent paintings are part of a new group of work, culled from her own photographs of models backstage during Paris fashion week. Inspired in part by an interest in Degas and his depictions of dancers at the Royal Ballet, Joffe's paintings of models reveal a sense of vulnerability and openness, characteristics not usually associated with the polished identity of high fashion. Joffe's provocative reappropriation of imagery challenges the viewer by providing her figures with poignancy and psychological depth. While seemingly casual, Joffe's paintings are highly observant, and capture not only the unique gaze of her subject, but the color, texture and pattern of their clothing and environment. The paintings in this exhibition are startlingly big, the figures larger than life. The model's body, already long, lithe and exaggerated, is further distorted due to the techniques Joffe uses when painting at such a large scale. Working on a scaffold (some paintings are up to ten feet tall), she must climb down each time she needs to view the painting from a distance, requiring her to work quickly. The looseness of approach is essential—these are not works that can be fussed over or made precious. Further, Joffe's physical proximity to the painting's surface results in areas of abstracted form and graphic blocks of lush, saturated color. When working large, Joffe thinks differently about her process: the material properties of paint itself become her subject. She has said in regards to the large scale works: "I don't want to tell a story; the paintings I like best become abstract at some level." An interview by Stella McCartney in the June issue of Interview magazine coincides with this show.